Pink came to the CMAs last night with a nomination to her name (her song with Kenny Chesney, “Setting the World on Fire” was up for Musical Event of the Year) and a performance on the lineup, but her red carpet arrival garnered plenty of attention too. The singer stepped out with her daughter, 6-year-old Willow Hart. Willow’s latest appearance may surprise fans since Pink has spoken about her daughter’s struggles being comfortable in her own skin. In fact, Refinery29 reported that Willow once told her mom she thought she was “the ugliest girl I know.” When Pink recounted that incident back in August at the MTV VMAs, she added that she let Willow know there are many different kinds of beautiful — and it seems Willow took that sweet message to heart. After their stunning strut on the red carpet, Willow changed into a more casual outfit (as did her mom) for the rest of the show, proving to everyone that there really are many, many kinds of beautiful. 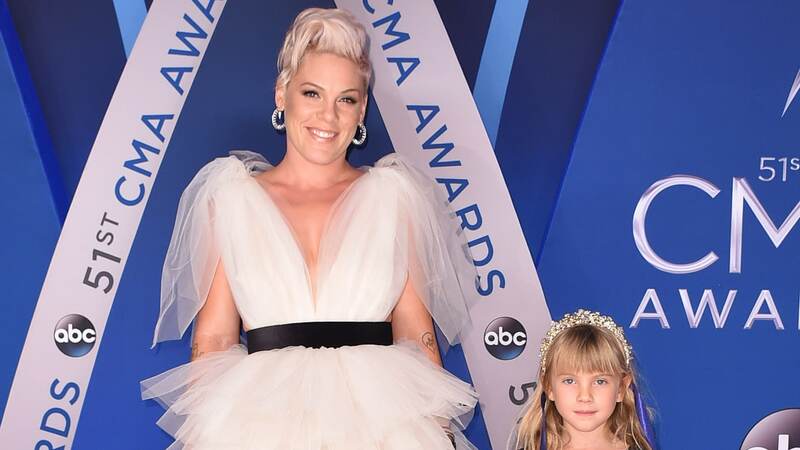 While her glittering headpiece and studded tulle skirt were certainly attention-stealing — Pink even helped her daughter adjust her headwear on the carpet, according to PopSugar — Willow’s mom certainly stole the spotlight when she performed her new single, “Barbies” during the telecast. In true Pink style, the performance was stellar, emotional and even acrobatic, proving to the CMA audience and viewers at home that Pink definitely belongs on that country stage, even with her pop pedigree. And while she and Chesney lost out to Willie Nelson and Glen Campbell, Pink and Willow may well have made the biggest splash in Nashville.